An investigation of the extra-photographic infrared region of Ge i utilizing electrodeless discharge tubes containing germanium tetraiodide, a grating spectrometer, and a lead sulfide detector has yielded 117 lines, observed between 11 252 and 23 922 Å. 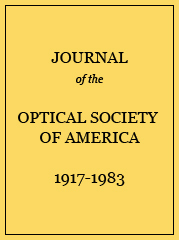 Subsequent interferometric determinations of 30 lines between 11 252 and 19 284 Å were carried out by scanning the circular fringes of a Fabry–Perot interferometer across the spectrometer slit to achieve accuracies of from 0.001 to 0.003 Å in this region. The motivation for this investigation came from the knowledge that the solution of difficulties which Andrew and Meissner [ J. Opt. Soc. Am. 49, 146 ( 1959)] encountered in establishing the levels of the 4s2 4p nf configurations of Ge i lay in the extra-photographic infrared. Of the 12 levels belonging to the 4p4f configuration they established only two by as much as a single pair of transitions; leaning heavily on the theory, they identified five others by a single transition each and predicted the positions of the remaining five. This investigation confirmed the tentative levels and established the missing levels which were found to lie close to their calculated positions. Similarly, values of 4d 3F4, 5f, 6f, and 7f 3G5, previously estimated by Andrew and Meissner with an uncertainty of ±5 cm−1, were verified and established to within ±0.1 cm−1. New values for the 6p 3D3 and 6p 1S0 levels were obtained. Also included are photographic grating measurements of a number of the weaker lines of Ge i not previously observed in the wavelength range 5006–10 858 Å which were obtained from 12 to 14 h exposures with electrodeless discharge tubes containing germanium oxide and neon. a Entries carried to the hundredths place in Å are values directly observed by use of scanning spectrometer. b Entries carried to the thousandths place are values directly obtainedby use of vacuum interferometer. c Entries below 11252 Å are the results of photographic grating measurements of weak lines not previously reported in this region. The relative intensities are on an entirely different scale from the preceding entries and represent visual estimates from spectrograms of 14 h exposures. The wavelength accuracy in general is 0.05 Å.
d This line was first observed by Kiess in a Ge air arc. Because of the large shifts involved in the arc, its wavelength from a low-pressure source is included here. a All level values and combinations in units of cm−1. The entry in parentheses above each combination is the intensity. The entry in italics is the decimal part of the calculated transition value. All wave-numbers above 9000 cm−1 are from photographic measurements and those given to three decimals are from the work of Ref. 3. Those three-decimal entries below 9000 cm−1 are interferometric measurements from Table I.
b The eight entries indicated by a superscript b are the only combinations within this partial array which were observed in the work of Ref. 2. Summary of contributions to levels of Ge i.
b This level (V) was supported by a single transition in the work of Ref.2 and has been verified by observation of one or more additional combinations; I improved level value, uncertainty now ±0.1 cm−1, formerly ±5 cm−1; N new level found near position calculated by former work; NR new level replaces level of Ref. 2, see text.